Most times, when Windows refuses to bootCause is BCD error (Boot Configuration Data). In such cases, the majority system administrators use command line utility Bcdedit.exeWhich enables them to create, edit or to delete entries from the BCD to Errors Fix boot. This utility is easy to use but not by users of the common operating systems WindowsAnd any mistake command lines Operating systems can become nonfunctional (Not boot). 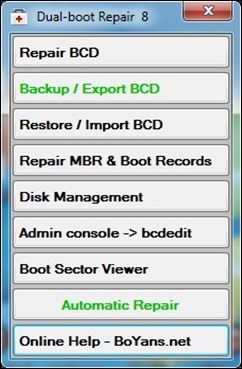 Dual-Boot Repair Tool is a free utility si portable (No installation required) with which Windows users can fix MBR errors (Master Boot Record) PBR (Partition Boot Record) and BCD via simple interface and easy to use and understand. 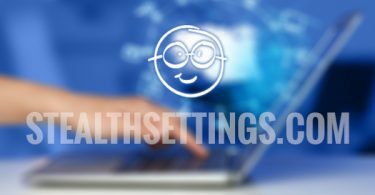 The remaining options are shortcuts by s native tools the system (disk Management or usefulness bcdedit) and for help page for tool available on the developer's website (online Help).